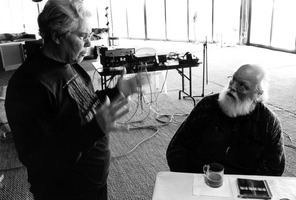 From a recording made on June 13, 1981 in San Francisco, as part of the New Music America Festival, this is a concert of new gamelan music by Lou Harrison, K. R. T. Wasitodipuro, and others. Lou Harrison’s music is known for its original and sensitive use of percussion and employment of just intonation. It also is widely appreciated for its lyricism and assimilation of techniques from East and West, as is clearly evident in the pieces heard here that incorporate Western instruments such as the harp, flute and trumpet with the traditional gamelan. These works are performed on two sets of gamelan instruments designed and largely built by William Colvig. They are the Gamelan Si Betty, named for Betty Freeman who made possible its construction, and Gamelan Si Darius, named after composer Darius Milhaud. The clarity of the sound and the complexity of the intertwining melodies is truly exceptional and as Lou Harrison points out at the beginning of the concert, the intent of these pieces is too leave your ears ringing as you exit the hall. An intent that is clearly fulfilled by this marvelous recording.